I assume you've read The Hitchhiker's Guide to the Galaxy. You recall the part where God is proven to exist at which point He is snuffed out of existence because He exists through faith alone? That's ultimately what's at the base of this. Can the unity of the text be proven? Cassuto did it. Can the antiquity of the text be proven? Sarna did it. Can the momentous event of Matan Torah be proven? Nope. For over 3500 years we have taken it as a given entirely on faith. If you don't have faith, that's something you're missing perhaps without even realizing it but that's what it all boils down to. I assume you've read The Hitchhiker's Guide to the Galaxy. Obviously this isn't the Torah concept of God, but I think you're just emphasizing that there's no proving God's existence, and therefore we "access" God only via belief/faith. For over 3500 years we have taken it as a given entirely on faith. Well, not exactly, at least according to traditional notions. I'd say as long as there were open miracles taking place, it wouldn't be "entirely" on faith. There'd be an all-important supernatural precedent in people's experience. I'd be much more apt to accept Torah Min Hashamayim on faith if there were anything shown to exist that's even remotely in the supernatural ballpark. And that has a great deal to do with how I lost my faith. Over time it just dawned on me that the claims being made in the traditional-Torah-belief arena don't comport with any kind of real-world experience. And those today who claim to have witnessed "miracles"? Every case without exception turns out to be a bunch of hooey. There's always another reasonable explanation. Plus, since these kinds of claims are made across all cultures and religions (e.g. finding the unmistakable visage of Jesus on a grilled cheese sandwich), that leaves Jewish "miracle stories" (present and past) equally suspect in my eyes. Do we really think we're the only ones with "real" miracles, and everyone else is self-deluded except us? Add to that what I said in the post - that Gods and miracles were commonly depicted in ancient Near Eastern texts... Add to that the fact that the laws set down in the Torah hardly seem "perfect" or "cosmic", but instead very specifically reflect the religious/societal norms of Bronze Age Levant and Mesopotamia... and I can't reasonably, in good conscience, justify faith in a supernatural Matan Torah. Is it a shortcoming on my part? Maybe. Or... Maybe it's a strength. Maybe in fact it's in the spirit of Torah to go after "emet" even when it leads you to uncomfortable, unpopular or downright counterintuitive places, and even if it means having to radically rethink certain areas of Torah itself. Maybe as strange as it sounds, that's what the Torah would call "kavod haTorah" - not just accepting things which have no reasonable basis and calling it "piety". That's what rings true to me. And yet I have this crazy love for Torah. I guess you might call that my "faith". > Meaning, if there was a Divine revelation at Sinai, what does it matter whether that revelation was recorded at different times by different people? The funny thing is that it doesn’t matter at all for Nach, only for the chumash. > Despite what the tradition would have us believe, the Torah has always been a covenant with ourselves. Which means we keep the Torah to the extent that we deem it as having inherent value, because we see it as being a net-positive for us, a good thing - personally, communally, and nationally. And that is a concept of Torah that no academic theory or scholarly hypothesis can touch. Yes, but it is not at all the reason that Jews kept the mitzvos through the millennia, nor the reason most religious Jews keep them today. It was/is assumed to be good because it is God’s communication to us. If you read it as mythology, it has no more (or less) inherent value than any other set of myths. Yes, but it is not at all the reason that Jews kept the mitzvos through the millennia, nor the reason most religious Jews keep them today. Agreed. When I began the paragraph with "But from where I'm coming from", I meant it to apply to the part you quoted as well. I'm suggesting the idea of keeping Torah for reasons which are entirely independent of supernatural existences or events. If you read it as mythology, it has no more (or less) inherent value than any other set of myths. A good point. First off, just to clarify (if not for you then for other readers), when we're talking about "myths" here, it's not simply in the sense of misconceptions about reality, as in something "MythBusters" would try to debunk. The myths under discussion here also carry teachings, impart a desired ethos within the culture. The Torah is the "Book of the Law". Law may be embedded within a myth, but it's not in and of itself a "myth". You can't "debunk" a law. Ok, so let's say for argument's sake that we have several different ancient texts sitting in front of us which combine myth and law. 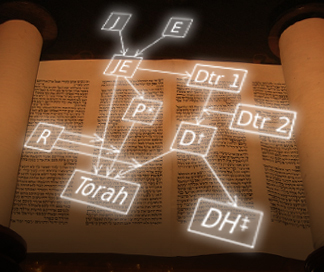 How does the Torah have any more inherent value than the others? I'm not arguing that it does. It may or it may not, and in any case that's a highly subjective determination. So why choose Torah and not something else? Because it happens to be my text, the tradition my people has poured thousands of years of investment into. It's in my kishkas. It speaks to me in a way that no other tradition does. Because for whatever crazy reason I care about unpacking the stories of Avraham in a way that I don't about the stories of Gilgamesh. Because the Torah discusses the holidays I observe. And whether it's historically accurate or not, it's about my people. Because with all its highs and lows, its more inspiring parts and the parts that drive me absolutely nuts - I'll keep coming back to it, because it's "home". Other texts and other traditions may be nice places to vacation, check out, learn from - but they're not home. So why choose Torah and not something else? Absolutely, and there are endless "ma'alos" I could mention about the beauty, sophistication and potential for personal/societal development that exists within the Torah system. But the question G*3 brought had to do with Torah having no more inherent value than anything else, and if I responded by bringing up all the special qualities of Torah, that would make it sound as if I was using that as a proof that Torah has greater value than other systems. And since I haven't investigated other systems, and I happen to live my life around Torah, I don't think that would be a particularly educated or objective assessment! So I essentially responded by saying "ein hachi nami" and gave the reasoning that I did.